This high quality plastic flameless candle is perfect for outdoor use, such as a BBQ party or garden decoration. In addition, it is a great gift choice, for Valentine's Day, Mother's Day, Halloween, Thanksgiving, Christmas, New Year, and the list goes on.... The flameless LED candle measures 3" in diameter and3"/4"/5"/6"/7"/8" in height. It is made from high quality plastic and has wax look finishing. This LED pillar candle looks, feels and flickers like a real candle. The candle has a built in 6-hour on and 18-hour off daily cycle timer. 2 AA alkaline batteries are required but not included. 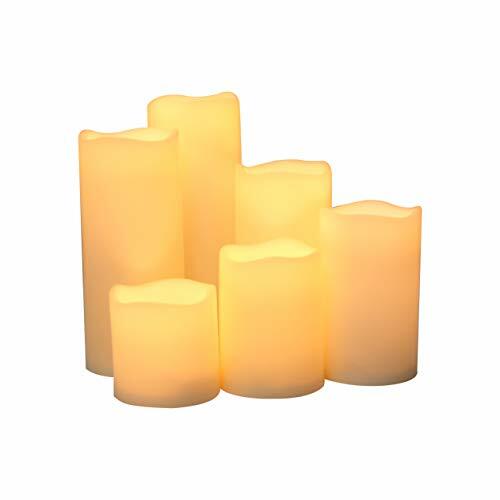 OUTDOOR CANDLE, these flameless pillar candles are ideal for outdoor use with no wax to melt. They are waterproof and can be used under any weather conditions all year round. PREMIUM, TOP QUALITY FLAMELESS PILLAR CANDLE, high quality materials, elegant design, premium soft flickering IC and bright LED, all these make top quality flameless LED candles. You will be impressed by the natural looking, wax feeling and soft glowing of these premium flameless LED candles. SUPER LONG BATTERY LIFE, one pair of alkaline AA batteries last approximate 1500 hours. Longer battery life means that fewer batteries will be used, therefore you spend less on batteries. If you have any questions about this product by iZAN, contact us by completing and submitting the form below. If you are looking for a specif part number, please include it with your message. Beichi Flameless LED Candles, Battery Operated Votive Candles with Timer, Unscented Electric Candles in Warm Yellow Flame, 500+ Working Hours, Set of 9, D 1.5" xH 2"